The Z-CoiL pain relief you love now comes in a stylish new form: Olivia. 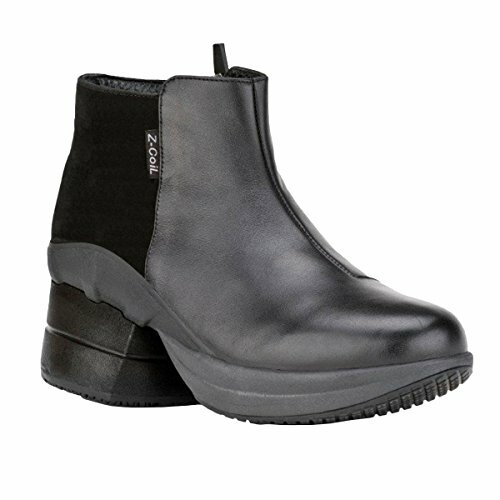 Its smooth leather exterior and chic shape make it an easy choice for work or play, while its ankle height, zip-up closure, and wide, rounded toe make that style comfortable. Plus its covered coil means the spring in your step will discreetly fit your style. Z-CoiL footwear is the original spring shoe! Z-CoiLs are specifically designed to relieve sever foot pain, leg pain and back pain. We have sold over 1 million pair since 1995. Try Z-CoiL today and find out why so many of our customers have found relief from plantar fasciitis, sciatica, Morton's neuroma, heel spurs, bunions, metatarsalgia, rheumatoid arthritis, diabetic neuropathy, hip pain and lower back pain. Every Z-CoiL shoe has a spring coil under the heel that acts like a shock absorber, putting less pressure on your bones, joints and muscles. Our patented pain relief footwear has a built-in rigid orthotic, giving your foot great stability and support. The forefoot includes nearly an inch of soft cushioning that shields the ball of your foot from too much strain and a round rocker bottom sole that assist with forward motion. Put all of these elements together and you've got footwear that improves posture and stability, makes steps light, easy, and enjoyable, gives you a confidence as you move through your day pain free. ANSI approved composite toe and a rocker bottom sole to aid a fluid, natural walking motion.